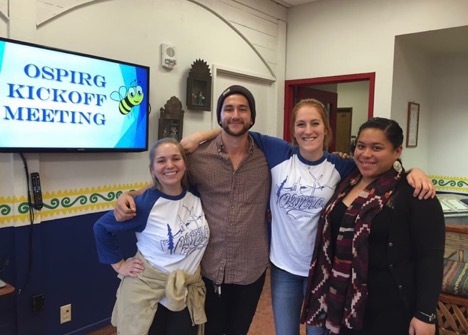 Southern Oregon University’s Oregon Student Public Research Group (OSPIRG) is back in full swing with new and existing missions including the existing “Save the Bees” campaign and their upcoming project called “Stop the Overuse of Antibiotics.” OSPIRG is a student run nonprofit organization that gives students the tools to put on events to bring awareness and attention to issues going on all around us. “Essentially what we try and work on is public health and public interest issues. Things like make college more affordable, and making the environment healthy,” said Evan Rattle the head chair of OSPIRG. “Forty percent of our bees are dying every single year, and that number is growing,” said Morgan Bechtold-Enge. “The biggest killer of our bees is a pesticide known as neonicotinoids.” She explained that this pesticide can be bought at any local hardware or garden supply store. The group’s new project is focused on limiting the use of antibiotics in the food we eat. “The overuse of antibiotics will be our generation’s biggest issue as far as health concerns go,” said Rattle. “Over 70 percent of antibiotics made in this country are made for livestock, not humans,” said Lindsey Rocha the Vice Chair of OSPIRG. “We’ve gotten McDonald’s, Taco Bell and Wendy’s and some of their suppliers like Tyson to switch to not using antibiotics.” According to the group things like this are huge in the agriculture world, because it prevents the illness of animals which ties into animal cruelty being reduced. Along with these popular campaigns OSPIRG has others including projects that help prevent and aid homelessness along with stopping construction of a pipeline through the Rogue Valley known as the Liquefied Natural Gas (LNG) Pipeline. Homelessness is a prominent issue in Ashland and OSPIRG wants to encourage students to work in soup kitchens and similar organizations to help prevent hunger within the homeless community. “It’s coming out to soup kitchens and doing canned food drives and clothing drives,” said Kieryn Eagy, the Vice Chair Treasurer of OSPIRG. 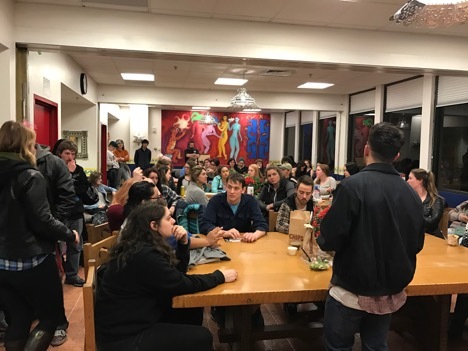 “Last term we were able to donate over a thousand canned food and clothing items.” In February they are planning on working even more in the community and hosting more food drives. Leaders of the group, Evan Rattle, Kieryn Eagy, Morgan Bechtold-Enge and Lindsey Rocha have taken individual responsibility for these campaigns yet work together to get everything done for each individual assignment. They are all passionate about their campaigns and hope to share that passion with other students who wish to be involved in these important issues.